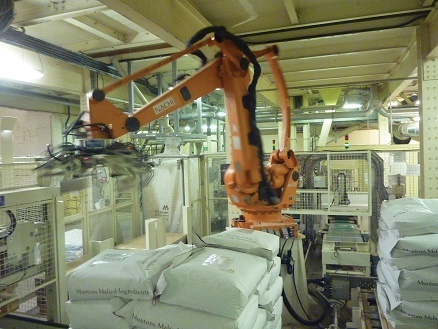 A turnkey robotic palletising line from Brillopak has doubled throughput at the Muntons malted ingredients factory in Stowmarket, and in less than 18 months achieved a return on investment by increasing efficiency and reducing the maltster’s reliance on manual labour. Prior to the automated Brillopak installation, the company’s Stowmarket mill was operating at maximum capacity, producing 17,000 tonnes of whole, crushed, flaked and milled malted ingredients annually. Used by the food and beverage industries, the business has experienced significant demand for malt ingredients, both domestically and internationally, with high volumes being distributed to Europe, North America, Russia, South East Asia, Japan, Africa and the Caribbean. “Increasing consumer demand for balanced and fortified diet has meant food manufacturers are using malt ingredients as a natural way to add flavour and sweetness to products,” notes Brillopak director David Jahn. Market analysts expect the global malt ingredients market to expand at a CAGR of 7.08% during the period 2017-2021*. With Muntons being one of the major suppliers in this sector, it was quickly apparent that production and packing capacity needed to be ramped up. One of the bottlenecks identified by Muntons at their Stowmarket mill was its palletising line, which stacks 25kg sacks of grain from two bagging lines, one manual and one automatic. To facilitate a higher throughput, Brillopak designed a user-friendly, efficient, dual line robotic palletising system incorporating a Nachi LP 130 four axis robot. Brillopak increased the robot’s reach range within the compact factory footprint and low ceiling area by mounting the robot on a plinth. “This enables the robot to work around obstacles like slipsheets and sacks,” comments David Jahn. Sacks from two separate packing lines feed the Nachi robot. Each line passes through a bag flattener, metal detector and labeller onto a pick-up conveyor. The robot feeds two different pallet stations, each with its own pallet dispenser. In order to cater to different sack sizes, the robot head automatically adjusts and loads two pallets at a time. Full pallets are moved down the line to a stretch wrapper with hooder. From there they are fed to a series of outfeed conveyors. Palletising at least 600 bags an hour, the Stowmarket site has more than achieved its strategic manufacturing goal of doubling throughput. “We wanted 50 per cent more throughput but we got more, exclaimed Mercer. The entire system is driven from a recipe-driven colour touchscreen HMI. Robot signals are fed to the HMI meaning that there is no requirement for the operator to use the robot pendant. For safety, the system is zoned into two areas, with safety guarding and CAT 4 light guards.